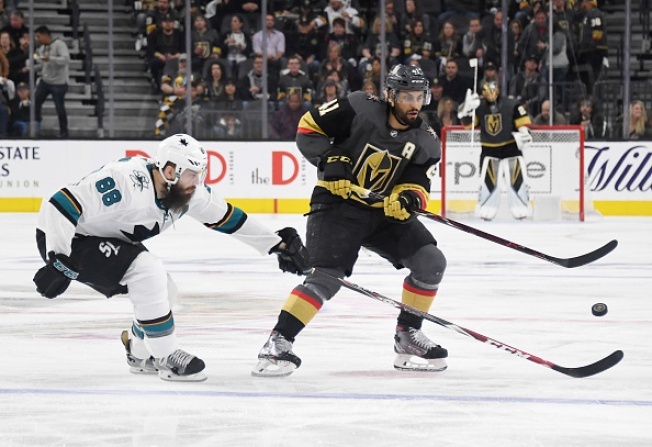 Once again, the San Jose Sharks allowed the Vegas Golden Knights to light the lamp just a little past a minute into Tuesday night's Game 4, and Team Teal never recovered in a 5-0 loss that put them on the brink of elimination from the Stanley Cup Playoffs. If watching the Sharks lose Game 3 for their first-round Stanley Cup playoffs series was painful for fans, watching Game 4 was just downright frustrating. San Jose outshot and outplayed the Golden Knights for stretches Tuesday, but the Sharks now are facing an early trip to the offseason. Here are three takeaways as the Sharks trail 3-1 in the series. Fleury on fire: There's just no denying it. The Sharks could have had a lead over the Golden Knights at the end of the first period with how hard they were working offensively. All four of San Jose's newly-fashioned lines were pressing to find the back of the net, not showing any let-up or quit. But Fleury, who San Jose's offense was able to frustrate so well in Game 1, just wouldn't budge. Even before he stopped Evander Kane on a breakaway chance in the second period, it was clear he was making a case for being the first star on the evening. Fleury's defense also did their part to halt the Sharks' best attempts to get on the board. Even though San Jose did good work to keep the puck in the offensive zone and continued applying pressure, Vegas' defensive effort added to Fleury's magnificent performance by blocking 18 shots on the evening. No help between the pipes: Sharks fans might've been tempted to breathe a sigh of relief when goaltender Martin Jones didn't allow the first goal of the game in the first minute of the first period -- until Max Pacioretty put the Knights up 11 seconds after it ended. San Jose's offense grinded on the other end to try for the equalizer, outshooting Vegas 18-7 in the first period. But, the Knights scored the next goal, taking a 2-0 lead into the second period. It arguably was the goal that changed the game, and it wasn't much of a surprise when Aaron Dell took over duties between the pipes starting in the second stanza. The Sharks' defense shouldn't have allowed Shea Theodore to maneuver his way through the Sharks' zone so easily, but Jones still needed to stop the puck on that play. Sharks coach Peter DeBoer noted during the team's losses down the stretch that they weren't getting the saves they needed, and the first period of Game 4 was the perfect example of that. Given the number of goals Jones has surrendered in the last three games -- within the first five minutes of the period or otherwise -- it goes to wonder if DeBoer decides to start Dell in net when the series returns to San Jose for Game 5 on Thursday. Defensive effort isn't getting it done: San Jose has had the bodies to fill in for injured players, but it was evident in Game 4 they still miss Marc-Edouard Vlasic. Really, the Sharks' big defensive woes started back in Game 2 after Vlasic left after getting hit by a Shea Theodore shot. It hasn't helped that Erik Karlsson hasn't looked healthy since Game 3, nor have the Sharks' abundance of turnovers since the series shifted Sin City. Poor puck management has given the Knights plenty of chances to capitalize, and they have done just that. San Jose now faces elimination Thursday when the series returns to SAP Center for Game 5, and the Sharks' defensive effort has let the team down two games in a row. If they are going to have any chance of defeating the Knights on Thursday and keeping their playoff hopes alive, their defense can't play the way it did on Tuesday in Las Vegas. There's just no other way around it.